Bringing the history of the University of Notre Dame's Fighting Irish to life, this record details the team's landmark games and legendary personalities. Compiled are accounts from sportswriters over the past century that document the most memorable games, profile coaching and playing legends, uncover the mystique of Fighting Irish football, and explain the Notre Dame phenomenon. A time capsule that recounts the greatest moments in Georgia lore and tracks the chronological progression of sports writing styles from the esoteric to the ultra-modern, this account details the popular team that has been to more bowl games than any other. The book chronicles the Georgia Bulldogs from their roots of glory to their modern-day triumphs. Highlighting feature articles, profiles, and game stories of Oklahoma Sooners football—one of the most elite programs in collegiate sports—this nostalgic compilation details the history of the team. Remarkable coaches, great players, national championships, devoted fans, and memorable moments in Oklahoma history have been colorfully documented by sportswriters around the country for nearly a century, and those accounts are presented here. Bringing the history of the University of Kentucky basketball program to life, this record details the team with the most wins in the history of the game and with some of the most devoted, knowledgeable fans. Compiled are accounts from sportswriters over the past decades that document the most memorable games, profile coaching and playing legends, and explain the University of Kentucky basketball phenomenon. Echoes of Kansas Basketball details the roots of the Jayhawks’ glory, their modern-day triumphs and everything in between for the legions of Kansas fans everywhere. Spanning the decades with the best columns ever from the best columnists, Echoes of Kansas Basketball takes you back in time to the early success of the Jayhawks and follows it to the powerhouse program of today. 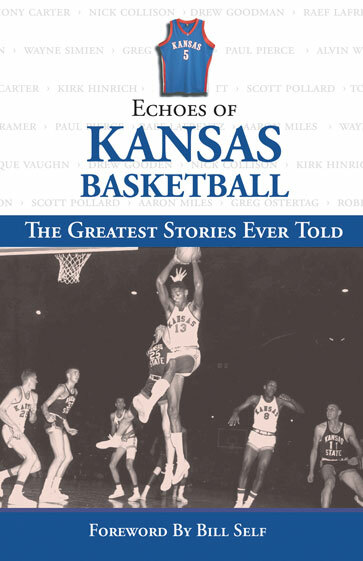 It not only recounts the greatest moments in Kansas lore, it also tracks the chronological progression of sports writing styles from the esoteric to the ultra-modern. Whether you followed 1952 national champions or the 1988 national champions, whether your hero was Wilt Chamberlain or Raef LaFrentz, Echoes of Kansas Basketball brings them all together. Their stories are waiting for you, as told by the most outstanding voices of the Kansas apparatus across the ages and guaranteed to remind you why you bleed crimson and blue. No other book this fall captures the scope and detail across the years that Echoes of Kansas Basketball offers the casual or diehard fan.